Yesterday was a hard act to follow, what with 18 new polls. Today we only have two polls, both from the South. In North Carolina Bush has increased his lead marginally. 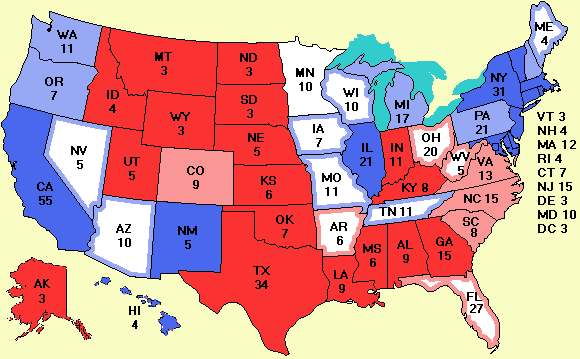 Clearly John Edwards has his work cut out for him if he is to bring in his home state. So far he is not doing it. The other state polled was Kentucky, it is still strongly for Bush. It is surprising that Kentucky is so strongly for Bush while neighboring Tennessee, with which it shares many characteristics, is a statistical tie. Could the ghost of Elvis be a Democrat? I updated the page with the hits from universities. Harvard is still #1. As has been pointed out to me repeatedly, this page is not very scientific because there is no correction for university size. Still it is a fun page and easy to do. I will update it from time to time, but not every day. Check to see how many political junkies your school or alma mater has. This site is growing in popularity. For the past week, we have been averaging over 15,000 unique visitors a day. The total number of visitors since we went live on May 24 is now well over 100,000. Spread the word.